The Republican who pulled off 2014’s biggest upset is very conservative—and very critical of big corporations. The DC-insider storyline about this being a great year for the Republican establishment is undergoing a rapid rewrite. For the first time since the post was formally established in 1899, a House majority leader has been defeated in a bid for renomination. And as political prognosticators, Republican stalwarts and savvy Democrats search for explanations, they are being forced to consider complexities they had not previously entertained—including the prospect of conservatives who are ready and willing to criticize big business. The result shocked the not just the Republican establishment but the DC establishment. The shockwaves continued Wednesday, as Republican aides said Cantor would step down July 31 from his position as the second most powerful figure in the House—ending the congressman’s run as a Washington power player who championed the interests of Wall Street and corporate America. That Wall Street connection was a central theme of the challenge that displaced Cantor. Dave Brat, who defeated the number-two Republican in the House by a 56-44 margin, tore into big business almost as frequently as he did the incumbent. “I am running against Cantor because he does not represent the citizens of the 7th District, but rather large corporations seeking insider deals, crony bailouts and a constant supply of low-wage workers,” declared the challenger. That was false—at least the liberal part. Yet Brat’s anti-corporate rhetoric distinguished him from Cantor, and from most prominent Republicans—whether they identify with the Republican “establishment” or the Tea Party wing of a party that in recent years has been defined by its subservience to corporate interests. From the start of the campaign, Brat was aggressive in his opposition to immigration reform—attacking Cantor for making tepid attempts to move the GOP toward a more moderate position on the issue. But even Brat’s crude campaigning on immigration came with an anti-corporate twist. “Eric Cantor doesn’t represent you, he represents large corporations seeking a never-ending supply of cheap foreign labor,” the challenger argued. It may be that hard-core Republican primary voters, particularly in Southern states where primary turnout is usually very low, will continue to threaten GOP members of the House and Senate who display even the slightest moderation on the issue. But the PPP data suggests that wasn’t the only factor in Cantor’s defeat. Indeed, recent polling by PPP and other firms suggests that the Obama White House and congressional Democrats would be unwise to imagine that a Virginia Republican primary result argues for an abandonment of immigration reform. 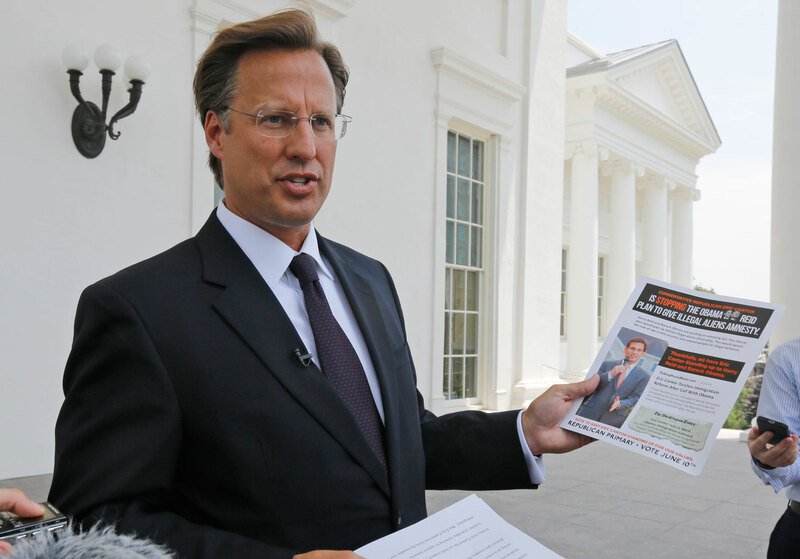 Are there other insights to be taken from Brat’s defeat of Cantor? Perhaps. And they could have implications for the broader politics of 2014 and 2016. Brat, whose campaign raised and spent roughly $200,000 versus Cantor’s $5 million campaign, attracted grassroots Tea Party support. But the professor actually missed meetings with top national conservatives that had been organized in Washington for mid-May—with the campaign explaining that Brat had to focus on preparations for final exams. His distance from the national conservative establishment, much of which aligns with the same business interests as the Republican establishment, was evident in Brat’s harshest criticism of Cantor. Brat is so little known at this point that it is hard to say where he will end up politically. He’ll face a solid Democrat in November—fellow Randolph-Macon College professor Jack Trammell—but his chances of winning the November election in an overwhelmingly Republican district are good. That language suggests Brat could align with others, such as North Carolina Congressman Walter Jones Jr., an old-right conservative, and Michigan’s Justin Amash, a younger libertarian-leaning member, who have run afoul of Republican leaders—including Cantor. Both Jones and Amash have reached across party lines and worked with progressive Democrats on a host of issues, including efforts to restrict NSA surveillance, to block free-trade deals and even (in Jones’s case) to amend the US Constitution to get corporate cash out of politics.